This year, we are fortunate to celebrate a new "miracle" in our time: marriage equality in Washington State. In this spirit, we will be honoring community leaders who were active in Referendum 74. 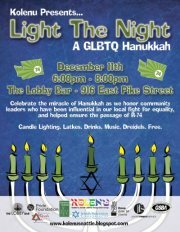 This event is made possible through the generous support of Jconnect Seattle, GSBA, Congregation Tikvah Chadashah, Pride Foundation, The Lobby Bar, Three Dollar Bill Cinema, Jewish Family Service, and The Jewish Federation of Greater Seattle.